Join the discussion on our forums! 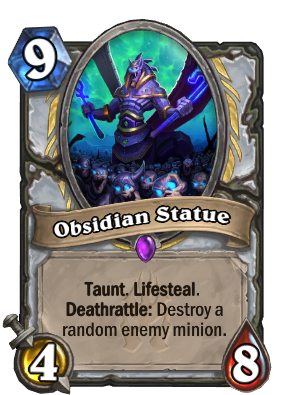 Come discuss Obsidian Statue over in our dedicated Obsidian Statue discussion topic. Absolutely nuts, that you can have two copies of this broken Card, should be a legendary in my oppinion! Incredibly powerful and my favorite card by far, with resurrection effect in the Priest - mind blowing. Every single time this card comes out...it seals a win for my opponent. With all the ways to make more than 2 of these appear...it's off the chart...OP. This is completely broken with resurrect effects. It'd probably be strong in those decks even without the lifesteal with how hard it locks down the board. Is pretty good now, not played in too many decks. The lifesteal and taunt make it decent, but the 9 mana makes it hard to play anything on the same turn. 4 attack is the bane of priest mirrors though, and buffing with Lady in White, Inner Fire, or even something like Bonemare gives a stupid amount of burst healing. This was broken in big priest. Thank goodness it rotated out. RIP wild players. Cornerstone of a deck whose win condition is convincing the other player that the game you're playing isn't worth their time. Yeaaaaaaaaaah, so much fun in wild. 5. Resummon all the dead copies with N'Zoth, The Corrupter. 6. Concede because repeatedly ramming your head into a self-repairing brick wall isn't fun. Broken in some matchups,hardly playable in others. Blizzard: "We rotated out Sylvanas because she was played in the vast majority of decks as a huge swing minion, forcing players to make very awkward turns if they didn't have some sort of silence effect." Also Blizzard: "Let's give priest a better Sylvanas, but don't make it a legendary." Blizzard goes nerf the wrong cards this one deserves a nerf !!!! !